Here's an attempt to synthesize a more lit-comp/ social studies/ science geared strategy for use in the math class. (We get used to that, am I right, math teachers?) For more info on think alouds, here's a post from Kelly Fisher-Bishop, an instructional coach in my district. The point of a Think Aloud is to get students verbalizing the text, engaging with vocabulary, and forming an understanding of the nonfiction text. 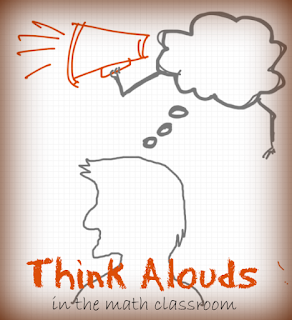 The "think aloud" part of the Think Aloud is a conversation between partners in which they explore meaning behind the words, connect concepts in the text to prior knowledge, define new words, and communicate their reasoning. My AP Stats kids did an introductory activity about binomial random variables (Lesson 8.1, TPS2e) today in class, played around with binomial coefficients and probability of discrete outcomes, and connected concepts (such as normal approximations) important in this lesson to material we've already mastered. The purpose of this Think Aloud, then, will be to formalize the connections they made today by drawing definitions and concepts out of two different informational texts about binomial distributions, getting down definitions, and sorting out the reasoning behind the construction of formulas and when their use in appropriate. I created a handout for them to read and annotate on, and I'm going to have them run the app the during step 2 of the Think Aloud, when most of the partner discussion will occur, and during their work on the practice exercise. Although this is two pages, my plan is to print these on one sheet, side by side. Certainly if its common practice for your students to be reading informational texts, using Think Aloud with your students (and meta-cognitively modeling what you do most days anyway) should help your students construct sense and meaning. For instance, in math or science topics, I'd say most Wikipedia articles are very informative and could be very useful for students' understanding. A common problem I encounter, however, is that there is too much information in the article that becomes noise for what I want to be reading. Giving a tool to your students to sift out unnecessary information and methodically go through the text can make them more independent as learners and less dependent on you or only YouTube.